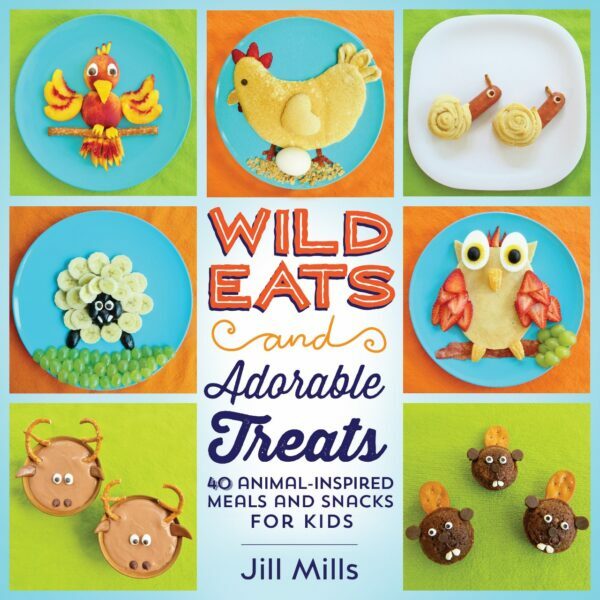 To say that my kids were excited about the new book Wild Eats and Adorable Treats by Jill Mills is an understatement. A big understatement. They filled the book with post-its marking off all of the recipes they wanted to make, but all agreed the granola gorillas were too cute not to make first! Making fun snacks and meals is a great way to connect with your kids–and Wild Eats and Adorable Treats is full of fun food for kids! All of the recipes have an animal theme and are super duper cute. Jill has even included fun facts and info to go along with each of the animal snacks so kids can learn as they cook. Did you know that gorillas are native to Africa? And while all of the dishes are adorable they are also totally doable which is necessary when getting in the kitchen with kids. You can create a fun snack or meal your kids will love to eat. The granola gorillas my kids fell in love with were great for a small group of kids to all help with at the same time. There are many things they can dump and pour and mix which makes them perfect for an afternoon or a sleepover activity. And in case you were wondering, yes, they are delicious with a morning cup of coffee! 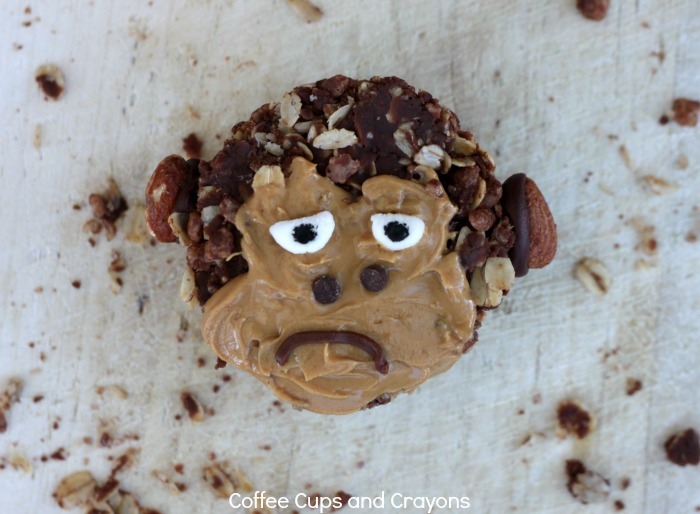 The gorilla snack is easy to make but it does need about an hour in the middle of the making to set in the refrigerator so take that into account when you’re ready to make them. Heat 1/2 cup of peanut butter and the honey in a saucepan over medium heat. When combined add in the cocoa powder and salt. Take off of the heat and add the oats. Once they are completely combined add in the cocoa crispy cereal. Scoop the mixture into 6 cups of a muffin pan. Press the mixture firmly into the pan and cover with foil. Place in the refrigerator for an hour to set. Pop them out of the muffin tin with a knife to decorate. Make the face with the rest of the peanut butter, this may be easier for an adult or older child to do. Add mini chocolate chips for the nose and marshmallow bits for the eyes. Use the icing to make pupils on the eyes and mouth. You can use a toothpick to make it easier to be precise. Attach the almonds to the sides with icing to make the ears and set aside for 10 minutes for the icing to set before serving. 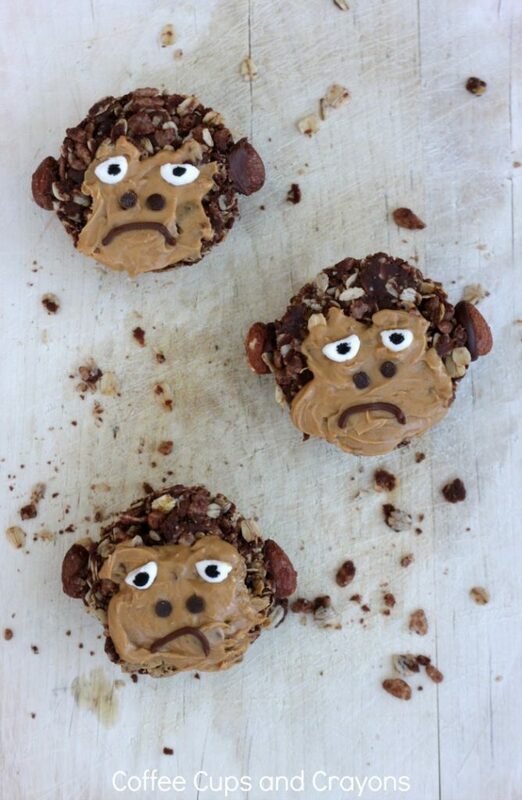 It’s safe to say that these cute little granola gorillas are just as fun to eat as they are to make. Now just to decide which recipe to make next…luckily we have lots of great choices already marked off! Grab a coffee and join the fun! Sign up for our newsletter today, just click here!